Wahoo, almost as cute as SpotMini. Now this, not a drone, is how I'd like my Amazon order delivered. I think it'd take more than one US election and the Oscars to "prove" that we're living in the Matrix! Bulldust. This is all retro kitsch design architecture from the 60s. This seems like something you'd read in Popular Mechanics. Establishing self-sufficient space habitats will serve as a backup plan for human civilization. A bit different from backing up your hard drive. "Your metal friend who's fun to be with"
More on this., and also the desire for vinyl and tapes. There's gold in them there Spaceports! This could be a weird ride. // Imagine you are a machine. >At the Enigma security conference, a University of Washington researcher described an experiment that demonstrated how a simple video game could be used to covertly harvest neural responses to periodically displayed subliminal images. While her game, dubbed Flappy Whale, measured subjects' reactions to relatively innocuous things, such as logos of fast food restaurants and cars, she said the same setup could be used to extract much more sensitive information, including a person's religious beliefs, political leanings, medical conditions, and prejudices. 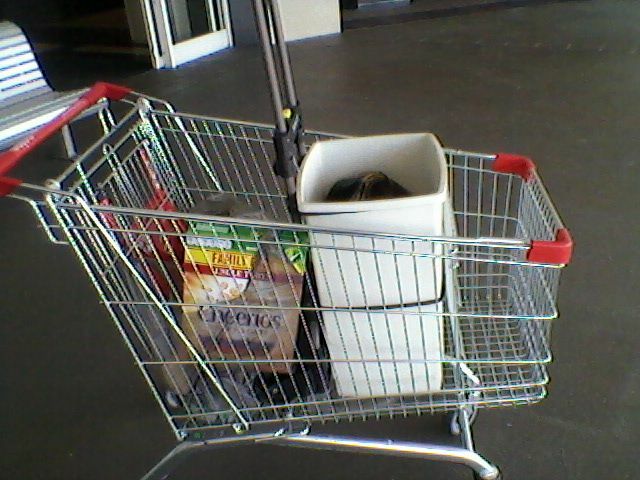 How to make your own shopping trolley!!! Now for a small amount of shopping these are almost OK, but they have two main issues. The first is that they never seem to be big enough for what you need to buy. The second is that they tend to wear out quickly with repeated use. Typically either the fabric rips or tears, or more likely the wheels (which are the cheapest part of the trolley) will break.That last can be really awkward when it happens on the way home. The solution to this is to make your own trolley, and it's simple (and relatively cheap) to do. The bungee cords go inside and around the shaft. These have a loop on the end that you can lock, and were better to use than ones with hooks because the shafts of the trolley were square in shape and hooks wouldn't hold properly. This rig initially (in 2007) cost me $29 for the work trolley from ALDI, $20 for the bin from Big-W, and $7.50 for the special bungee cords from Bunnings. That's $56.50 all up, but the wheels won't break easily on this and the fabric won't rip (unless you're doing something SERIOUSLY WRONG)!! 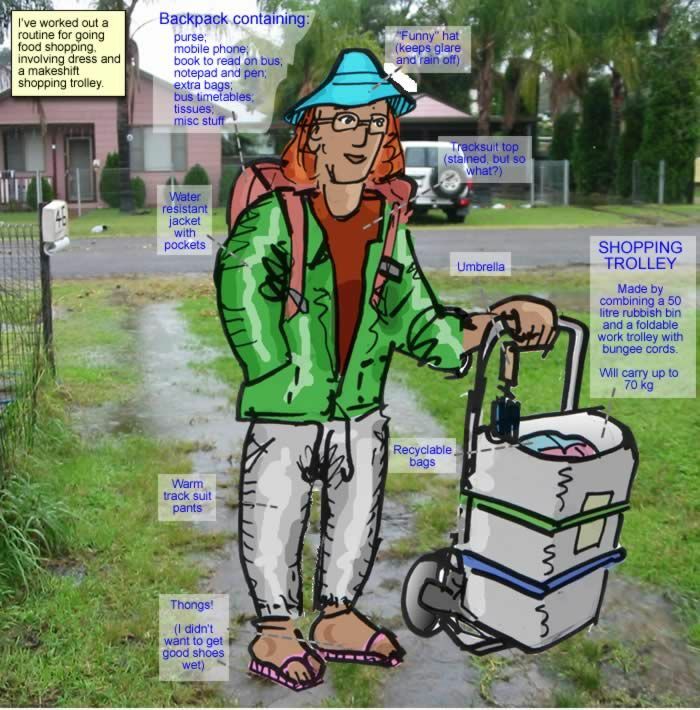 In general a trolley with no groceries in will be easy to carry on a bus or train. It won't take up much more room than a regular commercial trolley, and the only extra weight will be your own shoulder/hand bag plus 2-4 shopping bags. One technique I've used is placing the unfilled trolley into the middle of a shopping cart. As you go from store to store you place the purchased items behind the trolley, and put the items you're about to buy in front. Here's an example of that. I started using this technique based on my own needs. Two full front compartments is about the limit of what the trolley will carry, and I have a practise of shopping for groceries at Coles / Woolworths first, and then at ALDI second (mainly because they have sorting tables, which allow me to repack the trolley). Of course if you have other things to buy, like a magazine for example, you might want to buy those before doing your grocery run, rather than pull a full trolley behind you. Once you've finished your grocery shopping, find somewhere to repack your items into the trolley. Removed the trolley from the cart and place on the floor. Place heavy hard/items at bottom and lighter/bulkier items at the top. From my own experience I've found it best to use the trolley with a variety of shopping bags. 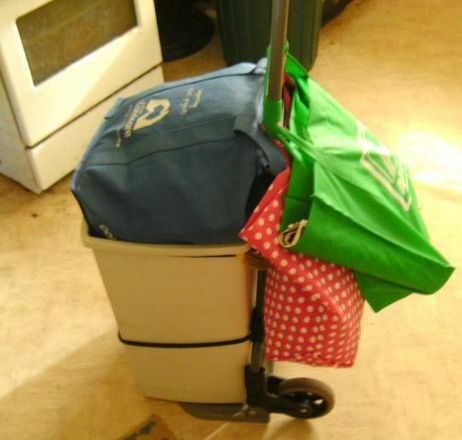 Heavy and solid items can be placed in the bin, but additional bags and be placed on top, and the handles of the bags placed around the trolley so that they won't fall off. Here's an example of that, being inspected by Bobby the dog. In the photo above I have a "cold bag" on top of the bin, and a couple of overflow bags on the back. 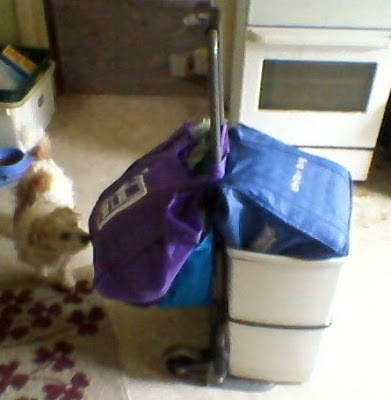 The purple bag on the top probably has bread (or something else that I don't want crushed) in it. 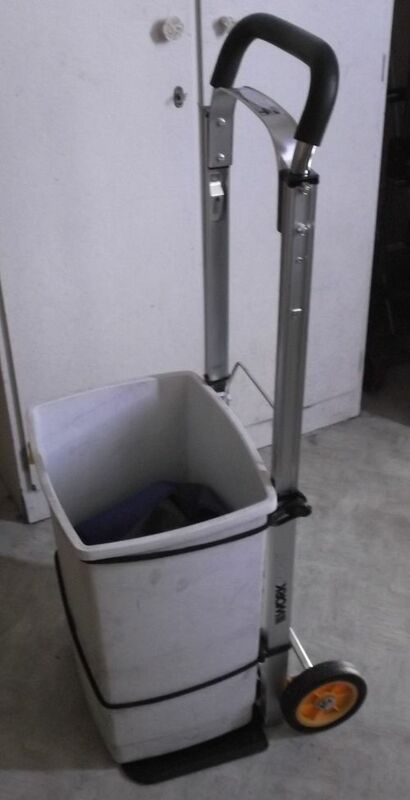 The main thing is to make sure that the trolley's centre of gravity is lower than the top of the bin, otherwise pulling the trolley will be a bit random. Pull the trolley with either palm up or down. It's better to pull it slightly to one side rather than directly behind. To get on the bus pull the trolley up to the door, step up, turn around and lift with two hands (bending knees if needed). When you exit the bus you can just pull the trolley out and allow the base plate to take the load. If you have to go up steps allow the wheels to take the load. Once you get home, unpack and store any objects in cool bags first. 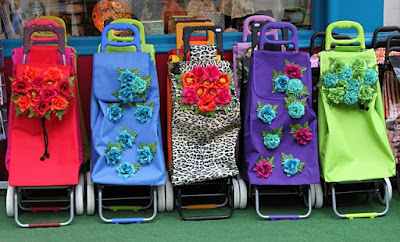 The trolley on the left was purchased as a special from ALDI in 2007. It lasted for 2 years until I started having problems with the wheels. The issue was that the mechanism that folds up the trolley base plate also folded the wheels backwards into the flat of the trolley. After a while empty trolleys, being lighter, would tend to fold up as I was walking pulling the trolley along! The middle trolley is one of several bought from Bunnings over the years. 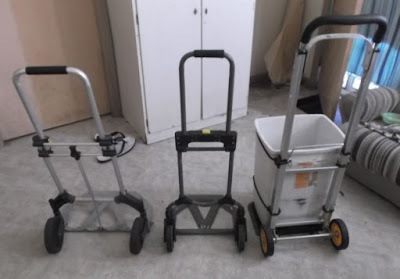 This type of trolley sometimes also folded up unexpectedly, but the main problem with it is that they wheels have soft rubber rims, and these wear out over time, especially if you don't have a sidewalk and have to pull them down a blue metal street! The trolley on the right was also bought at ALDI (in fact I assembled it on the sorting table) and so far has no problems. The other issue with these trolleys is their height. I'm 185cm tall, and the taller one at right is far easier to pull behind me than the other two, which for me involved a bit of a crouch. The width of the trolley affects which bags you can attach to them. I've found that cold bags will fit on all of them, but regular "eco" shopping bags struggle with the one on the right. 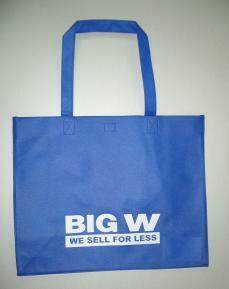 My solution is to use slightly larger bags from Big-W and longer bags from Bunnings. The other thing about these trolleys is the wheels. As you can see above, the first two have wheels that are explicitly attached to the trolley. That's only an issue when they wear out, like the ones in the middle, because you can't replace them. You then need to buy a new trolley. The wheels at right are attached with washers and a "splint". If these wear out I should be able to buy replacements or equivalents from a local hardware store like Bunnings. And that's it - pretty basic but way more effective than those silly frabric and plastic trolleys that break on you. This might have been that big announcement. Well good for them. I remember when I had a phone like this - I think it was a 3360, it ad a radio in it - that when dropped it didn't smash, but the back plate that covered the battery would just pop off and bounce somewhere at random. And the earphone plug socket was the first thing to go. But I can understand why people don't want a mini computer instead. I mostly use my mobile for actually phone someone (or more likely getting calls) and telling the time, though recently I I downloaded a timetable app that displays what buses run near to where I am, and when the next one's due. Now that's handy. Thing is, I generally DON'T use my mobile phone at home. I prefer a a landline and desktop instead. Heh - see if you can survive the trip! I only just found out about this, though the news is at least six months old. I only just found out about this, though the news is at least six months old. Apparently someone analyzing all the hacked and released accounts discovered that the majority of the women on the service WEREN'T REAL. Quite clever I guess, because men who signed up for server where "married people could have an affair" would hardly go public and complain. I finished part 2 of this. It may need some corrections as I was in a hurry. This tutorial looks at working with Leveller (a powerful 3D terrain editor for windows from Daylon Graphics) and OpenSimulator (Opensim). 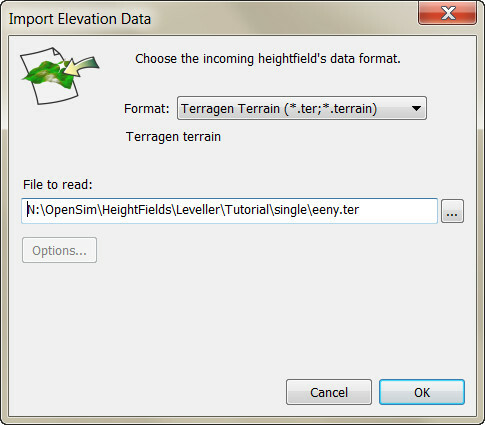 Part 1 explained how to import terrains from Opensim into Leveller. 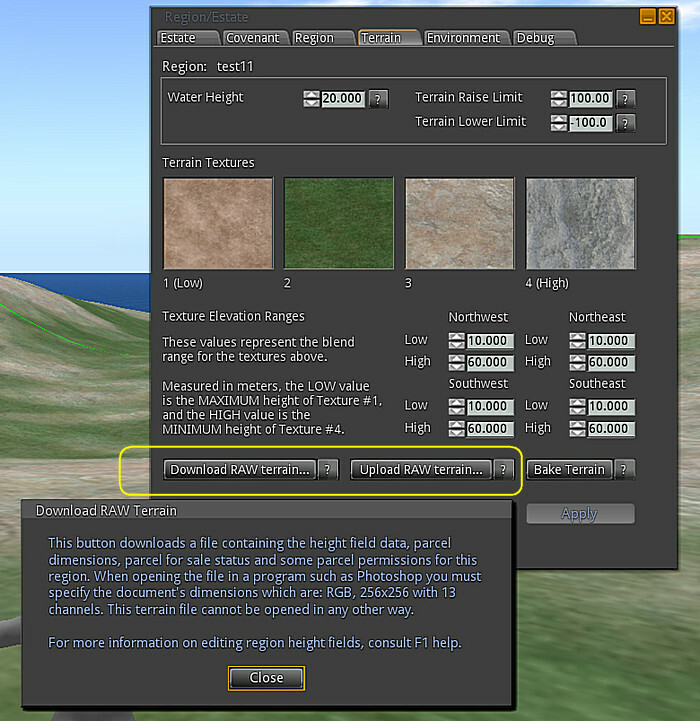 This part explains how to export heightfields in Leveller back into Opensim. This part uses the four regions of test00, test01, test10, and test11 to demonstrate exporting terrains from Leveller back into the grid. 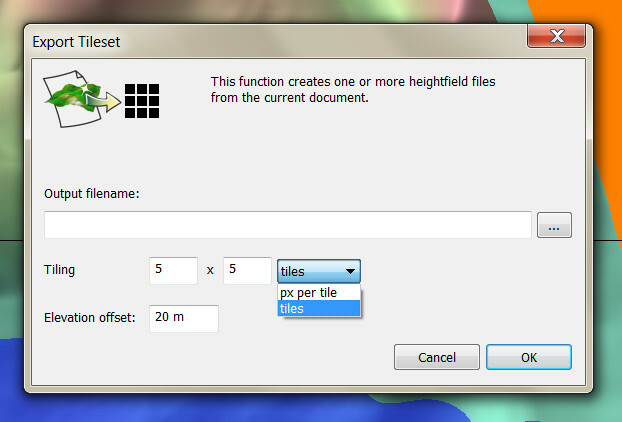 ...however the positions are only important when importing the heightfields files using load-tile command. This 256x256 document was created by creating eight shapes, giving each a height (as shown on the map at right and then selecting all shapes followed by executing a Shapes > Heightfield from Selected Points command. Finally the water level was set using Edit > Water Level > Elevation to 20. 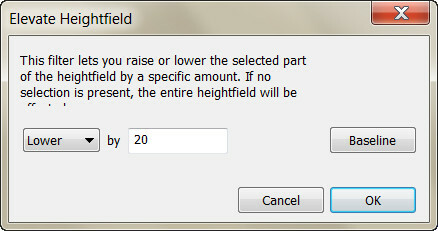 If the document has any heights less than zero you will get an error and the export will fail. 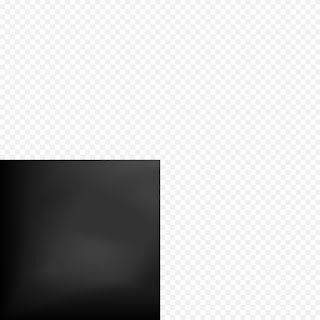 It's best to play around with Original Elevations and Use per-pixel scaling. Once you've exported the file, you can go in-world and load it via your viewer. The submerged area above is roughly at 20m and matches the default water level. However on the original Leveller document that coastline contour is 20.6, and clears the waters. There's some trade off and inaccuracy using the .raw format. Compare this with exporting in .ter format (below). 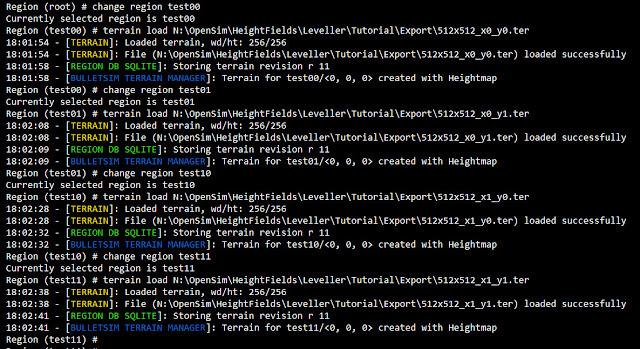 The following two methods use server commands to save region's terrains. Server commands are made within the Opensim console. These examples are taken using ConEmu, a "Windows console emulator with tabs, which presents multiple consoles and simple GUI applications as one customizable GUI window with various features". ConEmu, rather than the Windows command line was used, as ConEmu behaves more like a Linux terminal, with the user being able scroll back through previous lines and reports, and use the up arrow to see (and then edit) previous commands. Users are also able to copy and paste from and to the console easier that with the standard DOS prompt, and key shortcuts and colour schemes can be set for convenience. All this makes using the Opensim console a lot easier for a Windows user. Other OSs may have their own equivalents. ConEmu was used as I predominantly use Windows and Windows apps (and hence Leveller). .jpg/jpeg Joint Photographic Experts Group image format. ...not pretty is it? Most of the bumpiness and abstraction is caused by using an image format to save heightfield data. 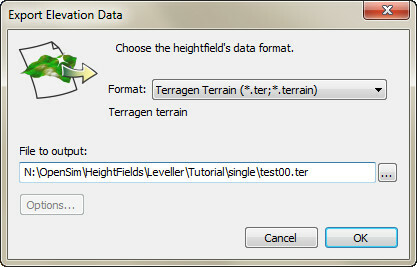 If you own or rent a region but can't access the console for that grid, see if you can get the administrator to use terrain save (see part 1) and terrain load to for you (using .ter format), rather than using a .raw file. You can just see the 256m grid lines on the map. This is also an example of the MicroDEM colour scheme. Leveller allows you to change display colours for heights. It's also an example of me playing around with different tools! ...and where: <filename> is the file name of the of the saved file (e.g. 2x2tileset(default).png), and <tile width <tile height> is the width and height of the tileset, and <xstart> <ystart> are the grid's x and y location of the south west corner of the tileset (e.g. 1102 1000 for the sample island is the test00 region). However, you must also select each region in the tileset in sequence, and then repeat the command for that image, in order to load the section of that PNG that corresponds to the region selected. Raises the current heightmap by the specified amount. 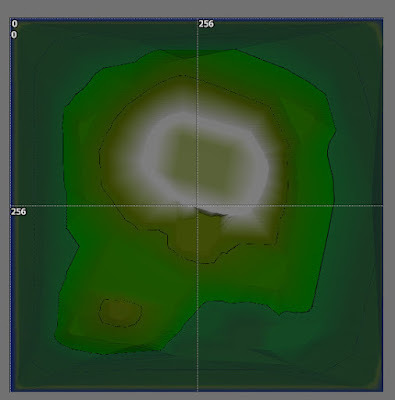 Lowers the current heightmap by the specified amount. 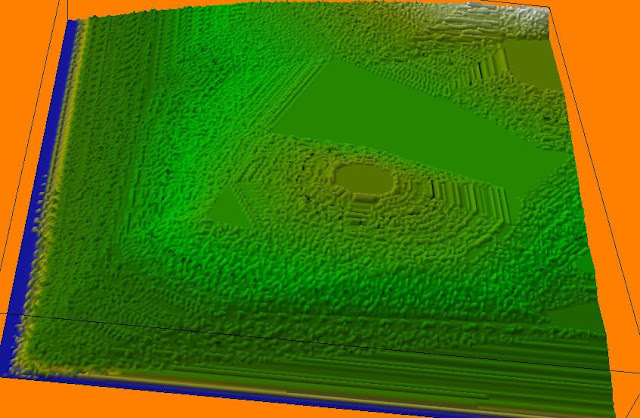 Multiplies the heightmap by the value specified. 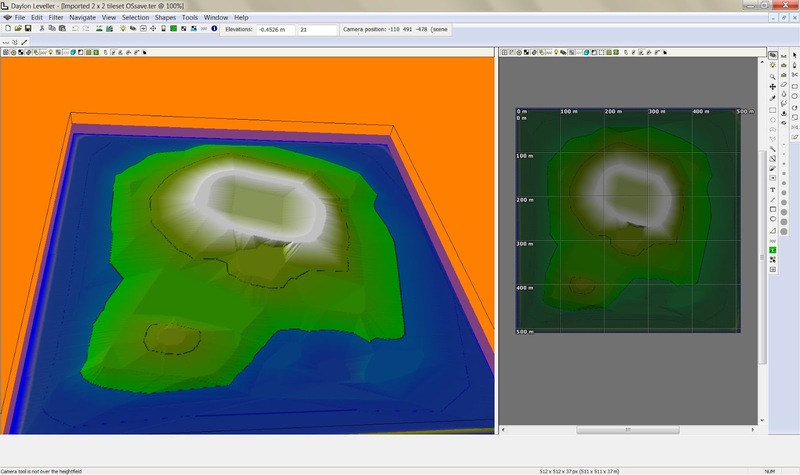 Loads the revert map terrain into the regions heightmap. 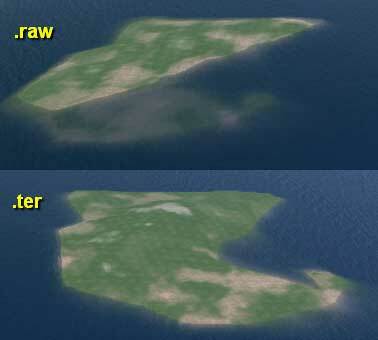 But, the solution won't always be to do that command - it varies depending on the terrain. 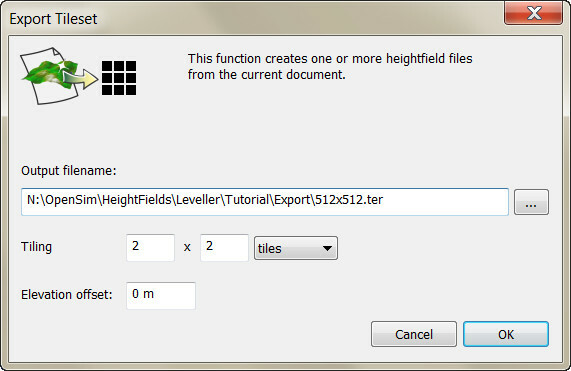 There is a third alternative, and that's to use the Export tileset feature of Leveller. There are several sets of options on this dialog. Output filename allows you to select both the directory to save the tile files in, and a "base name" to use how those files are named. The directory you use for a tileset export should either be empty, otherwise confusion might result.The base name (e.g. if you enter test.ter, the base name is test) is added to codes generated by Leveller to indicate where in the tileset the file goes. For example test_x0_y2.ter should be loaded into the region in the bottom row (numbering starts with 0) and 3 columns from the left. See below for an efficient way of doing this. Tiling has two ways to decide split up the document into tiles - by px per tile, and by the number of tiles across and down the tileset. 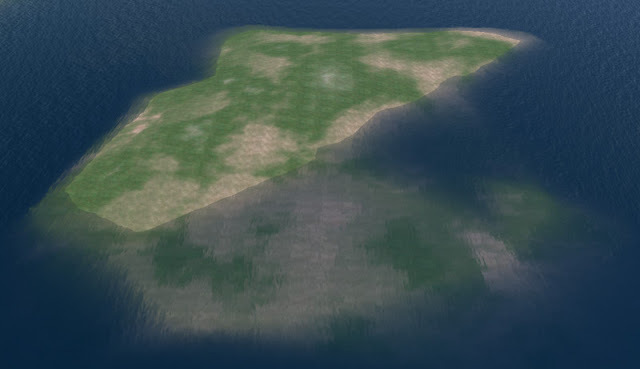 If you always use the same size regions (and they'll always be square in Opensim) then you might just just use that option (e.g. 256), but choosing the second might be easier if you're working with larger sized regions. 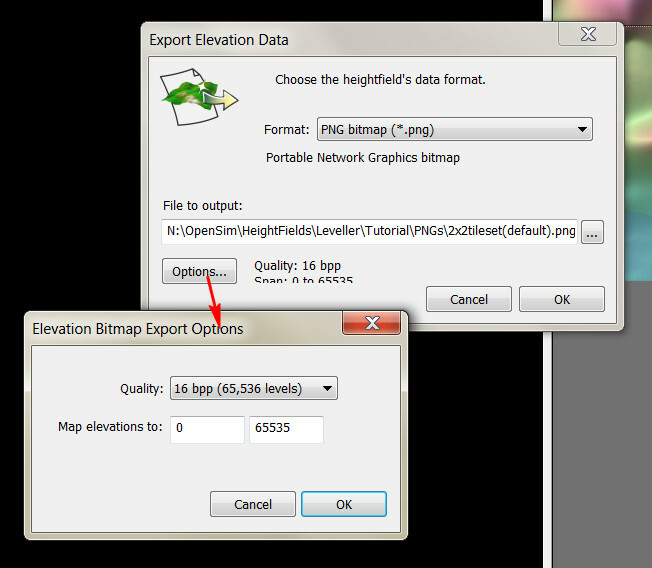 The Elevation offset is added to the the heightfields of the exported files, and works the opposite way to the same option on Import Tileset. 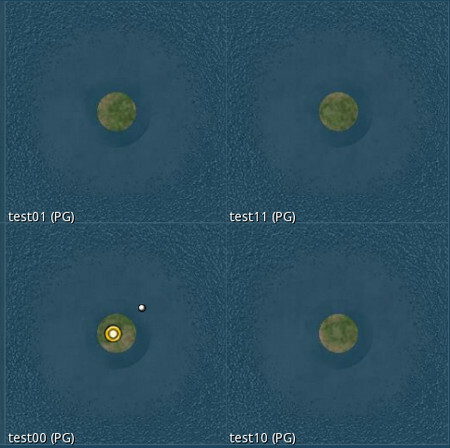 It defaults to 20 which matches the default water level in Opensim, but can be changed. 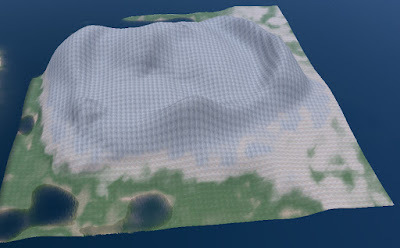 Part 3 shows how to make terrain using shapes. Thought I'd give this free Windows player a try. Thought I'd give this free Windows player a try.  Has many features, and I think I need to make a CLEAR skin for it, just as I did for RadioSure. This happens way too often, and the people who do it think nothing of it either. Um, wasn't the old excuse for mistakes "Cosmic Rays"? 'When your computer crashes or phone freezes, don't be so quick to blame the manufacturer. Cosmic rays -- or rather the electrically charged particles they generate -- may be your real foe. While harmless to living organisms, a small number of these particles have enough energy to interfere with the operation of the microelectronic circuitry in our personal devices. It's called a single-event upset or SEU. A neutron produced by a cosmic ray and traveling at nearly the speed of light strikes a military C-141B Starlifter carrying over 100 troops at 37,000 feet over the Sea of Japan. Immediately the pilot notices something is wrong. Very wrong. The plane is suddenly banking to the right and is in danger of going out of control. What is happening? I've written part one of a two part tutorial about using Leveller with Opensimulator. I've written part one of a two part tutorial about using Leveller with Opensimulator. Part one is all about importing one or more region's terrains into Leveller. Part two (about exporting them back into Opensimulator) will be completed soon. 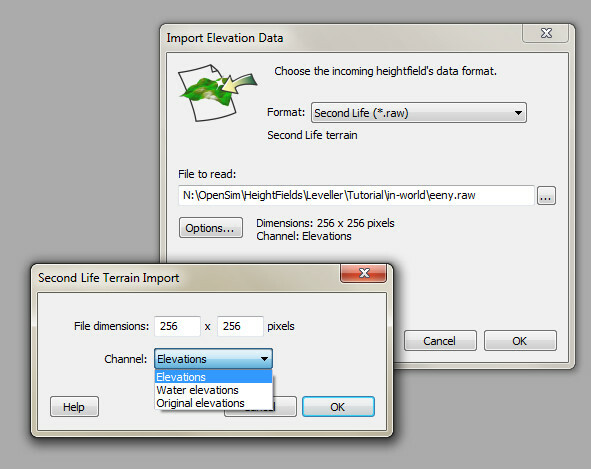 Leveller is a powerful 3D terrain editor for windows from Daylon Graphics. 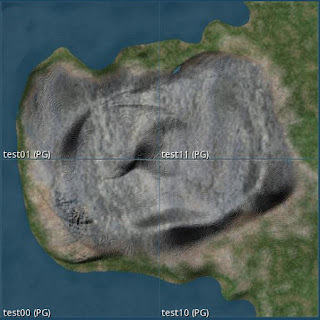 With Leveller the user can "paint" terrain, use vectors to create contours (which can then create heightfields) and use a variety of filters and tools to create distinctive and realistic terrain features (see the website for a more complete list of features). 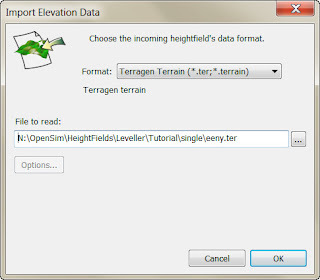 Users can also import and export heightfields in a variety of formats, and the latest update includes methods to easily import from and export to terrains with OpenSimulator (Opensim for short). This tutorial gives a run though on how to do that and why. 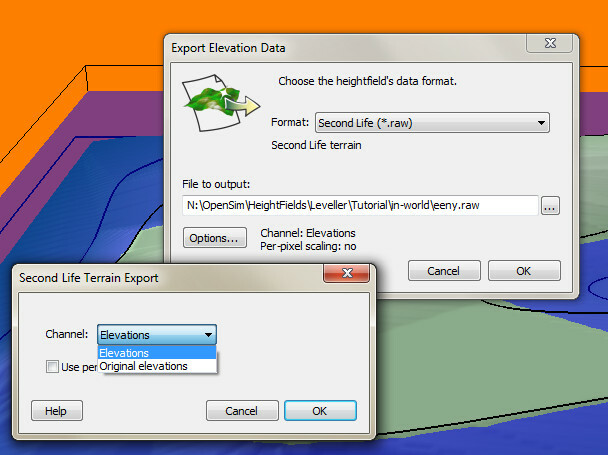 Why use an external terrain editor? 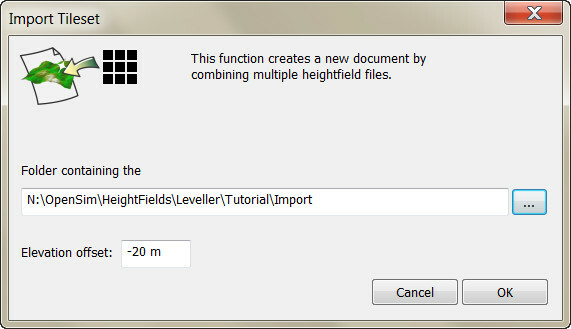 Once you have a separate heightfield document, you can usually export it to a different editor if you want, and also use it in other applications (such as Unity). The positions only become relevant when importing and exporting tilesets of multiple regions. 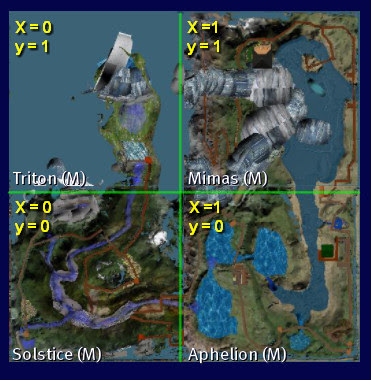 We'll tackle importing to Leveller in this part, as the tutorial assumes you already have one or more regions in one or more grids (even if that is only a stand-alone grid). This import can now be edited in Leveller. There may be some inaccuracy in using .raw files. 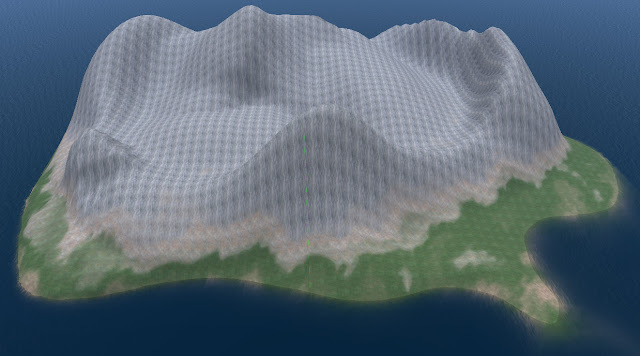 Notice how using Terragen instead of Raw gives a smoother result. The above is a 2x2 tileset, surrounded by non-region water areas. The above is a 3x1 tileset, surrounded by non-region water areas. 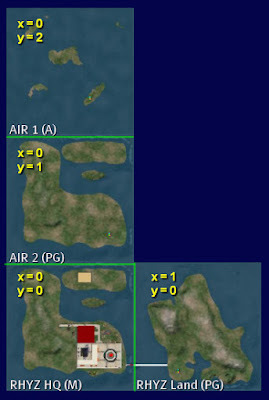 The above is a 2x3 tileset, surrounded by non-region water areas, but one that also includes gaps where there are no regions. 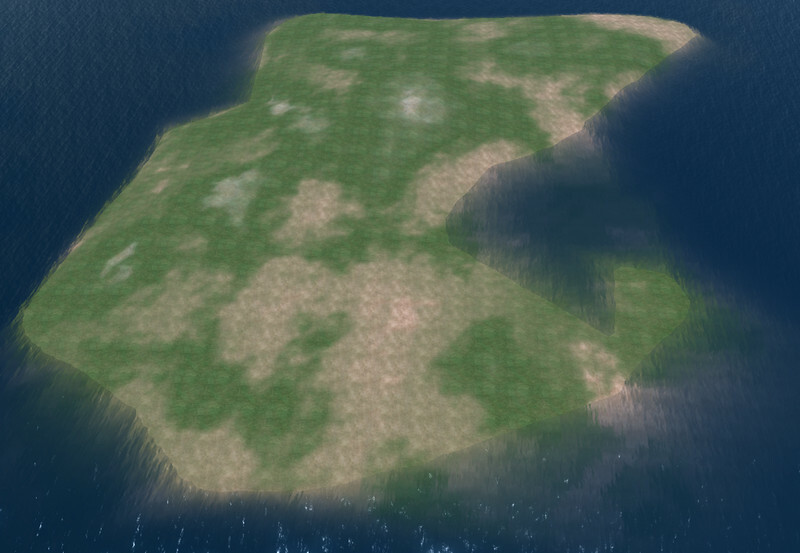 The large island in the example used for this tutorial is a 2x2 tileset. ...and where: <filename> is the file name of the of the saved file (e.g. 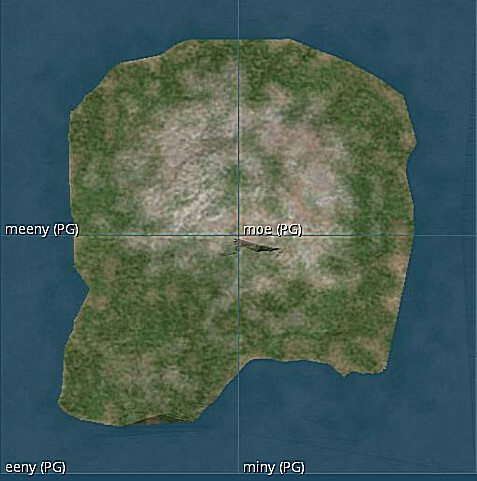 EnnyIsland-all.png), and <tile width <tile height> is the width and height of the tileset, and <xstart> <ystart> are the grid's x and y location of the south west corner of the tileset (e.g. 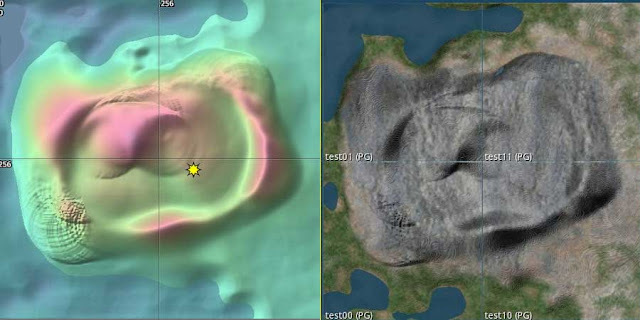 1100 1000 for the sample island with is the eeny region). The command is a little buggy in that it may fail if you add a path to the file name of the saved file (under Windows it gets saved in the \bin sub-directory) and a single command doesn't save all the regions terrain, but rather the terrain of the region you have currently selected. Note how the terrain looks very terraced. 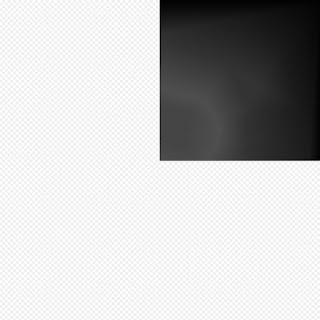 This is a result of using a graphics format instead of a heightfield format. Leveller now has an Import Tileset option which will automatically import saved terrain files from a tileset and place them correctly - provided you name the terrain files correctly first. To do this, you follow through the procedure outlined under For single regions for each region in the tileset. 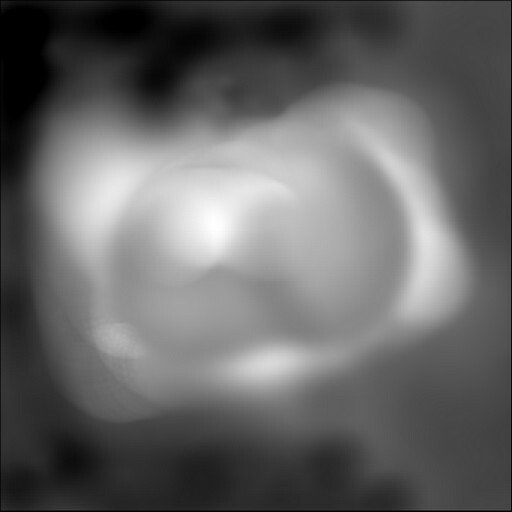 Each file must be in Terragen format (.ter) and its name must use the syntax base_xN1_yN2, where base is any text you want as long as it is the same for each tile, N1 is the horizontal tile index starting at zero and growing eastward, and N2 is the vertical tile index starting at zero and growing northward. You can have gaps in the tileset, like the 2x3 tileset from 3rd Rock Grid. In this case Leveller just replaces empty positions with blocks of 0m heightfields. If true, that's a huge relief. That Tesla guy was pretty clever for his time. I always get this mixed up with Virtual Machines. More playing around with Leveller. Generates planets? Now that's when you use AUs! This might be the sale I've been waiting for.